Glamping, festivals and holidays: the options for camping keep getting bigger. Camping is all about freedom and fun in the fresh air. A different pace of life, novel experiences and a change of routine. It’s a chance to re-charge the batteries, sleep soundly and relax as hard as you like. The leisure and tourism sector constantly has its challenges. But experience has shown that consumers are always reluctant to cancel their holidays. The camping and caravanning sector has weathered storms and hardships over the years and is currently enjoying a boom. There is a sweet spot where economic data, consumer desire for nature, sustainability and outdoor activities, a hankering for destinations closer to home and a wish for a holiday experience which is, well, just a little different, have all converged. According to the National Caravan Council (NCC), the UK camping industry ‘is at the forefront of UK Tourism. The majority of businesses in the industry are SMEs or micro-enterprises, usually independently owned and managed as a family concern’. The industry now contributes more than £6 billion per year to the UK economy (with revenue from sales of related products and services, holiday bookings etc). After a sharp decline between 2009 and 2010, the industry saw a period of unrestrained growth fuelled by the rising popularity of the ‘staycation’ in the wake of the recession. Growth in the sector has also been maintained by the emergence of the ‘glamping' craze, the pop-up phenomenon and the rise of the fashionable festival culture. The National Caravan Council estimates that well over 1 million households have a taste for holidaying in the great outdoors (caravans, caravan holiday homes and motorhomes). And that’s before you count significant numbers of ‘casual’ campers or glampers who just fancy the idea now and again. The NCC also ranked the top ten locations for camping holidays: the Lake District topping the list with Pooley Bridge and Keswick as the favourite destinations, Cornwall in second place followed by the Scottish Highlands. There are campsites across all countries and Europe has long been in the vanguard. Many campsites sprang up in the post-war years with farmers seeking new revenues and looking to tap into the leisure boom. Orchards and fields were turned over to grassy pitches (with 11,000 campsites in France alone, it’s not hard to find one with apple trees beside your tent, still standing and bearing fruit). Continental campsites have a special charm, and this was beguiling to the intrepid British travellers of the 1960s and 70s, who set off to foreign climes. Today it is much less of an exotic adventure and we take it in our stride. Indeed, the allure has been so strong that each year more Brits take the plunge and buy campsites in France, Spain and elsewhere to enjoy a slice of the good life on the continent. With technological advances and the global village, it is perhaps less daunting than once it was. This can be a major step and a big project so you want to know where you stand. Aside from the obvious basic research and professional advice, there are a few legalities to bear in mind. The type of toilet/washing facilities on site. If it is open for less than 28 days. Plenty of Brits are still choosing the traditional campsites as an inexpensive getaway. But the time is ripe for growing numbers of campsites and glamping sites to blend their offering with other activities and consumer trends like foodie-ism, foraging, sailing, star gazing, crafts and more. Such specialist offerings can give a commercial edge or USP and be readily communicated through digital marketing. The latest wave of the pop-up phenomenon abides by the ‘28 day rule’ creating a new kind of camping entrepreneur. No planning permission is needed for tents operating in this time frame, so savvy landowners are creating their very own pop-up campsites, often catering to local events. And for those without their own kit or caravan, the choice has extended beyond just tents, static caravans and mobile homes. Many have seen the future and the future is glamping. Glamping sites allow people who wouldn't normally go camping to experience alfresco living – with home from home comforts (think electric lighting, sheets and bedding, towels and toiletries provided), along with sometimes quirky features (a hot tub perhaps, or simply collecting your eggs from the chicken run). Truth be told, glamping is not really that new. It can be traced back centuries to nomads and Mongolian hordes who liked to travel with certain comforts. Genghis Khan himself was possibly no stranger to a colourful throw and a few scatter cushions. Whether he insisted on complimentary toiletries we’ll never know. Later the Victorians travelled throughout the colonies with all manner of home comforts and essentials, from brass chandeliers to upright pianos. Today, glamping is all about the experience, something a little different, a special ambience. And yes, in a world of global brands and international consistency, no doubt in part some of the demand is fuelled by ‘instagram-worthy’ unique features. Pod - modern accommodation that comes in all shapes and sizes, often made from wood, fully insulated and double glazed. Those aside, campsites can be found offering accommodation in elaborate treehouses, subterranean ‘Hobbit holes’, large spheres like spaceships slung between trees and even converted aircraft. The resurgence of music festivals (not to mention those for food, literature and more) has also played a big part in the camping revival. Any self-respecting festival now offers glamping options alongside the traditional pitches, generating a wider appeal, increased revenues and more consumer choice. Garri Rayner, founder of goglamping.net believes glamping’s growth has been accelerated by these festival goers. He states in the Guardian that the glamping sector has ‘grown up with the popularity of festivals’. The rising interest in outdoor activities and thirst for all things vintage has also fuelled the outdoor accessories market. The simple, back-to-basics, ‘holidays as we used to have when we were kids’ vibe has gone hand in hand with glamping. Retail trends and high street designs have played their part. Designers like Cath Kidston produce on point, quintessentially British florals, kitsch bunting, patterned tipis and pretty picnic sets. These kinds of retro-chic products have helped make camping cool again and brought it firmly into the mainstream. Camping has become an integral part of the British summer alongside Pimms, barbeques, jaunty Bake Off-style cupcakes and hedonistic festivals. 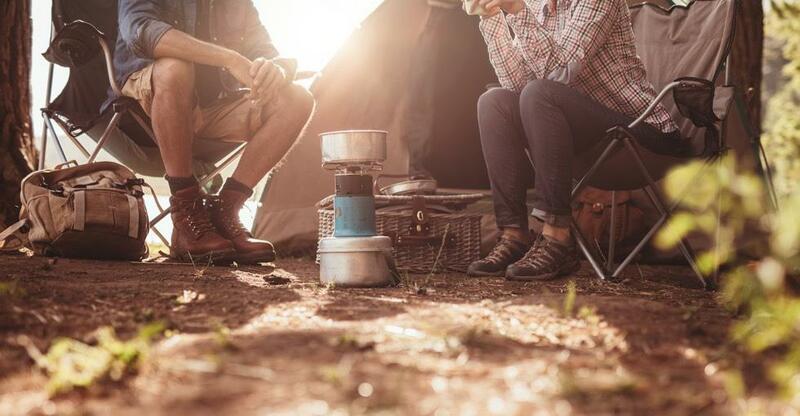 The camping industry is set for a strong and sustainable future fuelled by the growing number of options available – from camping in the back garden through to a simple rural campsite or a lavishly equipped continental campsite, complete with glamping options. A recent article in Wales online states that the 100 plus campsites run by the Camping and Caravanning Club have seen a ‘15% increase in families holidaying in yurts and pods etc.’ in the last year and their Ready Camp network looks set to benefit from this demand. And the notion of spending a few days, or rather, nights outdoors chimes with our growing need to occasionally feel unplugged from modern life. The 2016 Mintel report demonstrated our need for constant connectivity (the fear of being unable to work or maintain contact even while on holiday), and glamping, to some degree, goes some way to addressing that. Recent years have seen a growth in demand for outdoor holidays. In particular, strong sales of motorhomes have buoyed the manufacturing industry but, more interesting, is the nature of this demand. Much of it is driven by people seeking a different lifestyle (less rooted, freer), or a way to enjoy specific activities, perhaps windsurfing, bird watching, climbing or walking. So, as traditional campsites have matured, they have found new ways to diversify and offer ever more sophisticated (and costly) infrastructure - perhaps elaborate pool complexes, golf courses and so on. At the same time, the rise of glamping has created fresh, incremental demand and now represents a solid commercial part of the mix, becoming a category within its own right and helped by accreditation schemes like Visit Britain’s to formalise the professionalism of the sector. There is little doubt that we will be carrying on camping well into the future…. Russell is associate editor of the Alan Rogers Guides. Since 1968 Alan Rogers has produced guides of “independently inspected and selected” campsites - covering over 30 countries across Europe. Here we give you our guide on how to buy a campsite, with useful tips from two campsite owners who went through the process themselves. Camping is on the rise! Find out how to take advantage of this when selling your business.